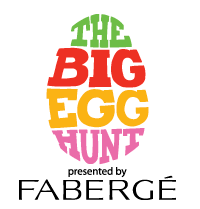 London will be fascinated by the sight of 200 giant eggs hidden around the city this Easter for the Lindt Big Egg Hunt. Artists and designers including Sam Taylor Wood have designed and decorated large glass fibre eggs to be displayed during Lent for 40 days around the UK before being auctioned for charity. Lindt and Action for Children are the two partners behind this exciting event. 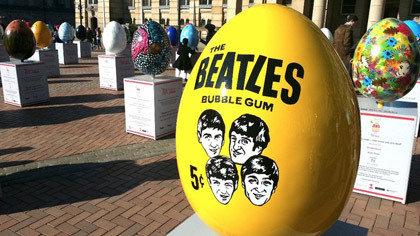 Vincent McEvoy's Little Shop of Rock has produced the 'Beatles Bubble Gum' egg using images from America the year The Beatles stormed the charts there in 1963. This small piece of ephemera captures the commercial style of The Beatles in the early 1960's. These tiny fragments of a different time can take us back to this carefree era in seconds. Vincent McEvoy said "I remember not being old enough to be allowed to go Liverpool or to The Cavern, but vividly recall The Liverpool Daily Post front page when The Beatles stormed America on their first visit. Andy Warhol always told me if you take a small image and blow it up as big as possible it can become something different.